There are three major factors that determine the natural vegetation of any given area. These are climatic, edaphic and biotic conditions. The climate of the UAE is desert-influenced, with little rain in the winter months and long hot summers. Vegetation throughout the country is dominated by arid zone species, since none of the hills in the east and north are high enough to counter the summer heat. Edaphic factors concern the soil. This is generally poor throughout the UAE and consists typically of subkha, sandy or rocky areas lacking particularly nitrogen. Wind erosion of the surface is also a factor inhibiting vegetational spread. Biotic factors are those concerned with other disturbances. These include over cutting by man (for fuel, timber, thatch, fencing, medicinal purposes and food), over grazing by wild and domestic animals, fires, and any other form of damage. At first sight, it would seem that these factors would be an inhibiting influence on vegetation. This is not necessarily the case. The whole of the country has been used for nomadic grazing at some time and there are also distinct zones. The East Coast is influenced by the Indian Ocean monsoons. Because of the steep wadi runoffs, and short distance between hills and coast, there is not a great mat of vegetation. However, annuals and perennials survive in great quantity on the hillsides and there is a greater abundance of trees than elsewhere in the UAE outside the oases. Over on the Gulf side, winter rains are occasionally heavy, and the high humidity especially on the coast helps to sustain some vegetation in summer. Plant life throughout Arabia has adapted to local climatic, edaphic and biotic conditions. 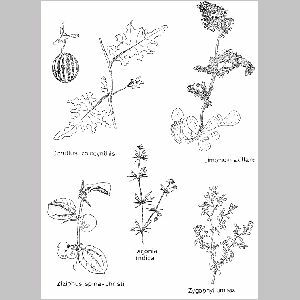 Arid species predominate and seed, protected in tough coverings, can be blown around for years awaiting moisture or a suitable niche in which to germinate. Several species have evolved spines or distasteful, even poisonous, substances to deter would be herbivores. To simplify the situation, the UAE can be divided into coastal, semi-desert and desert vegetation zones. In all zones salinity is a problem, and where it is too concentrated, as in the true sabkhas, no plant life can grow. A few plants exist in all three zones. A few plants thrive in the muddy lagoon areas of the coast where there is some protection from direct wave action. The largest of these is the Mangrove (Avicennia marina). This small tree can tolerate extremely high saline conditions and the lower parts of the branches and leaves may be covered by water at every high tide. It is a distinct species and has adapted specifically to its environment (see Bulletin 9). Other halophytes, or salt-tolerant plants, exist in the same marshy habitats as the mangrove. Closest to the water line is a zone of mixed green algae, sometimes accompanied by glasswort (Salicornia sp.) and grass wrack. Where the mud gradually gives way to mixed calcium carbonate and stony deposits, other plants have a foothold, replacing the halophytes of the water's edge. Saltwort (Salsola) and many grass species have adapted to this environment, as well as the parasite Cistanche spp. with their yellow hyacinth-type flower heads. A different habitat is found on the low (one of two meters high) rocky outcrops that frequently face the shoreline, particularly around the east side of Abu Dhabi Island. Here the sea lavender (Limonium sp) is conspicuous in February and March with its clusters of mauve flowers. In areas close to human habitation, again common in Abu Dhabi Island and Sadiyat, Portulaca flowers in profusion in March and April. It is one of the first plants to colonize disturbed ground, especially where organic waste has infiltrated. Between Abu Dhabi Island and Qatar, the coastal region is dominated by sterile subkha. North from Abu Dhabi, however, the coast is gently undulating and several salt-tolerant shrubs and grass species more typical of semi-desert conditions are dotted all over the landscape. Immediately inland of the subkha, and beginning right on the fringe, there is another vegetational zone. West of Abu Dhabi, this begins at the foot of the bluffs that can be seen to the left of the road driving towards Tarif and beyond. Various saltbushes, including Zygophylum spp., Halopeplis perfoliata (khurrayz) and Haloxylon salicornicum, along with sea lavender and various grasses (especially Panicum and Cyperus spp) now dominate the vegetation. Zygophylum is the bright green, dense bush very common throughout the UAE and Halopeplis tends towards various colors, with notably red and orange fleshy leaves. The sandy soil remains very saline. At Tarif, it contains around 23,000 ppm salts. Only saltbushes can tolerate the lowest levels of the subkha fringes. Haloxylon, with its minute silvery-white flowers (February and March), is popular with camels, which tend to avoid other saltbushes if there is a choice, because of their purgative effects. As a general rule, the salt content of the sand decreases as one moves inland, except in the lowest depressions which may be as sterile as the coastal subkha. At Habshan, some 22 km in from the coast (30 km southwest of Tarif), the soil consists of around 12,500 ppm salts. 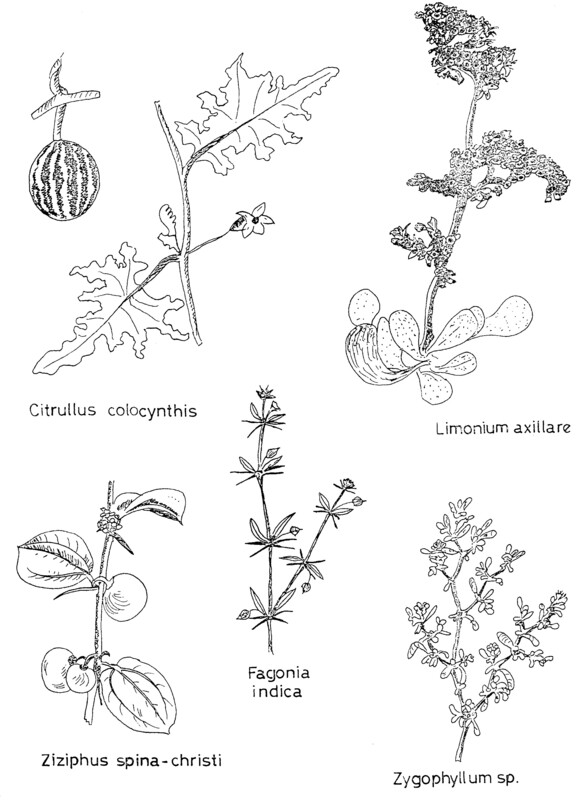 Zygophylum spp remain much in evidence, along with Haloxylon persicum. 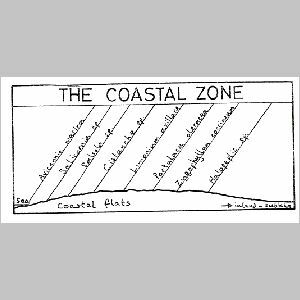 The advantage of 'sweeter' soil, however, is offset by other factors away from the coast. 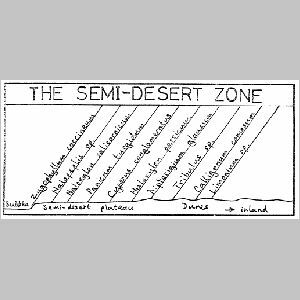 An all dune habitat with its unstable surface subject to sand storms, minimal precipitation and high temperatures, are not exactly conducive to ideal growing conditions. Of the smaller plants in this zone, some 40 km plus from the coast, Dipterigium glaucum and Tribulus longipetalus are two that have adapted successfully. The former grows as a slender inconspicuous bush with several thin stalks up to half a meter long, each stalk bearing at intervals minute yellow flowers during March and April. Tribulus is a squat, spreading plant with buttercup-shaped flowers. It is noticeable that both these plants grow much larger in the protected parts of established plantations where water is abundant. In such favorable conditions, Tribulus grows not only outwards but upwards, too. Where the white coastal sand gives way to the orange sand of the inland desert, there is another vegetation change. An indicator of this change is Calligonum comosum (arta), a large woody plant common in the Liwa and adjacent areas. It properly belongs to an all-sand environment. For most of the year this near-tree appears lifeless with blackened, gnarled stems, broken and twisted, lying on the sand as if dead. However, in February and March, the plant comes to life, with small bright green leaves and tiny flowers. Later in March the vivid yellow or reddish tufted fruits are very conspicuous covering all the outer twigs. Most arta plants have some dead branches still attached. In former times the wood was the major fuel source of local Bedouin. This plant indicates lower salinity in the sand. In the depressions, Zygophylum bushes are common in the Liwa and all plantations. 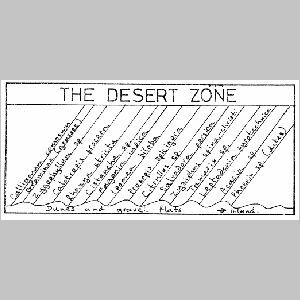 Many of the semi-desert species are also found deeper in the desert, but some are restricted to this interior zone. One such plant is Leptadenia pyrotechnica (Markh), a very large bush widely used in the Liwa for stabilizing dune faces. From a distance, it looks like a large patch of marram grass colonizing a buff hillside. In March it is a mass of yellow flowers, though like most desert plants the flowers are not noticeable until close up. The probable reason for this is to render the plant less conspicuous to grazing animals. The roots of Markh are extremely long, tapping the water table usually to be found close to the dune base. Other deep desert plants include Rhazya stricta (Harmal) that grows as a shrub with elongated, oleander type leaves and white flowers. Like the oleander, to which it is closely related, it is poisonous and avoided by animals. It can be found on silty gravel plains, rather than on sand, often following the line of barely perceptible mini wadis. Calotropis procera (Ushar) or Gunpowder tree is more of a very large shrub with its broad gray green leaves. It is poisonous, exuding a thick white juice when cut or damaged, and is therefore avoided by herbivores, though because of its dense foliage it is host for a variety of insects. Because it is left alone in overgrazed areas, it tends to become a dominant species. Formerly charcoal made from the wood of this shrub was highly prized. Clusters of flowers, each five-petalled and white with pinky mauve edges, appear throughout the spring, covering the shrub, which grows up to three meters in height. C. procera is a desert plant, but often found in dry watercourses. Fagonia indica (Mushikka), a small (up to half a meter) slender plant with spiny stems is more often found in association with desert hills, but has become fairly common in plantation areas. Tiny pink and purple flowers appear in March and April. One interesting plant is Ipomea biloba, strictly speaking not a native of the UAE at all, but apparently introduced from further east with the past few years. It is an ivy-related trailing plant with bright green leaves and purple trumpet-like flowers. It is commonly seen in plantations and also disturbed areas such as old building sites in Abu Dhabi. Another prostrate plant is Citrullus colocynthis or Desert Gourd, commonly found in shallow wadi habitats particularly in the Al Ain region. Its small yellow flowers are like those of a cucumber, appearing in March and April. The fruits are poisonous, tennis ball sized green or yellow striped gourds. Some examples of plants common in higher rocky areas have already been mentioned, but a visit to the East Coast hills, or Jebel Hafit, will show that such areas are a distinct vegetation zone. In particular, they are profuse with grass species, including Cyperus, Panicum (also desert species), Pennisetum divisum, Cynodon dactylon and Aristida spp. One common hilly shrub is Euphorbia tirucalli (Isbaq), a leafless succulent with erect candelabra like stems up to one and a half meters tall. In some habitats it is the dominant large shrub. Around the lower parts of Jebel Hafit and outlying ridges can be found the wild caper, Capparis mucronifolia. It is often found as a dense, straggly bush overhanging a cliff, usually facing roughly north. It flowers in mid to late summer, the flowers opening out in the first hour or so of daylight, then closing up as the sun warms up. Various convolvulus species are also common, particularly in Fujairah, where the greatest variety of hill vegetation can be found. They are all small, usually with flowers a bare two centimeters in diameter. Surprisingly there is a reasonable variety of tree species in the UAE. In desert regions, clumps and single specimens of Prosopis spicigera (Ghaf) are not uncommon, sometimes growing to 12 m in height. This is the tree species seen on the Al Ain road halfway up sand dunes. The flowers are similar to bright yellow catkins and appear in March and April. It is usually the largest plant in its environment and as such is a favorite nesting spot for sparrows and warblers. The base trunks are often very thick, but the tree is difficult to climb because of its mass of intertwined branches and numerous spines. Ghaf roots are capable of pushing down 20 m or more to tap underground aquifers. Very common in the east and north of the country, but also represented in desert regions are species of >acacia (Samar). The commonest is A. tortolis. The Acacia is easily distinguished from the Prosopis by its characteristic flat top, reminiscent of African savannahs. This tree flowers in June and July. A. ehreubergiana is common in the Al Ain region, where its balls of yellow flowers are conspicuous in April. A rarer tree is Salvadora persica (Rak), the twigs of which are still used as toothbrushes by desert people. This tree sometimes resembles a thick creeper growing alongside a Prosopis or Acacia. Towards the hills, especially in rocky wadi areas, Ziziphus spinachristi (Sidr) grows in abundance. There is a cultivated version lacking spines, some of which are represented in Abu Dhabi souq. The small yellow fruits are edible and popular with children in April. This species grows to 10 m in the wild. Tamarix articulata is widely used in plantation areas as windbreaks. It is not common in the wild in the UAE. In any description of the natural vegetation one eventually has to mention the date palm, of which there are dozens of species. The variety commonly grown in the UAE is Phoenix dactilifera, which in the past was a major source of food and timber. This tree needs a lot of water to become established, but once it has survived a year or so, it thrives even when neglected.